The opportunities following the swift Japanese subjugation of Burma in early January 1942 were not exploited. For their chastened opponents, Allied operations in this theater of the war were limited to raids and small-scale offensives as war efforts in North Africa and Europe, as well as the South Pacific, drew higher priorities for resources and personnel. For much of 1943 and early 1944 the fighting in Burma was relegated to WWII's backwater by both sides. With the end of the monsoon season in 1944 the strategic situation had changed. Not only were Japanese fortunes declining precipitously elsewhere, but the build-up in Allied forces along the Burma/India border did not go unnoticed. Determined to pre-empt any Allied attack, the Japanese launched an offensive of their own in May, the largest they ever launched outside of China, against the Allied positions in and around Imphal and Kohima. The battles that raged among the jungles and mountainous hillsides of the Indian and Burma frontier, and the subsequent Allied victory that followed in July, marked a fundamental and permanent shift in the war. The Allied offensive in March 1945 was one marked by extensive planning and preparation, as well as bold and daring maneuvers that not only took the Commonwealth and Indian forces across the Irrawaddy River to Rangoon, but crushed the defending Imperial Japanese Burma Area Army. 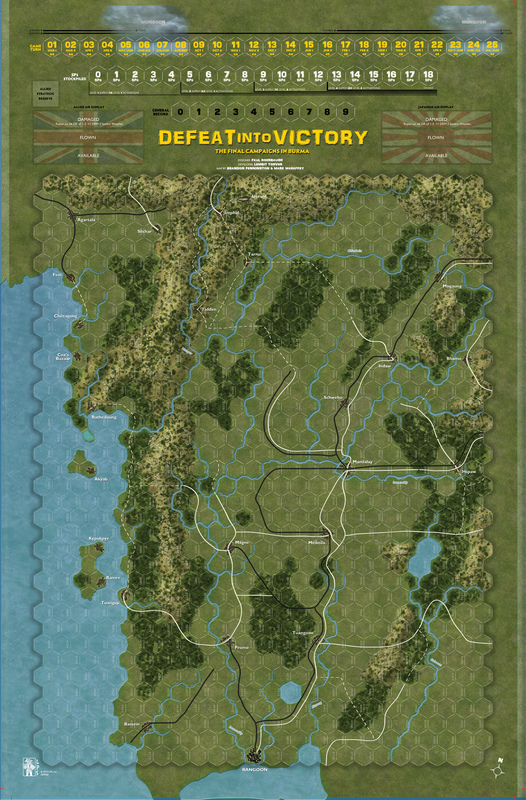 Defeat into Victory, by designer Paul Rohrbaugh, covers this neglected aspect of WWII history, using a very interactive and easy to play (chit-pull activation system) design. The game map stretches from Dimapur in the north to Rangoon in the south. Rules cover supply (a crucial aspect in terrain that was among the most inhospitable of the war), various types of combat (fire, maneuver and assault), as well as morale and leadership. Rules also include random events (that simulate the effects of battles and decisions by higher-ups elsewhere), weather, Japanese suicide tank attacks (human combat destruction squads) and changing war goals. The air campaign is also simulated (in much more detail than generic "air points"). Scenarios include the initial Japanese offensive against Imphal and Kohima, two on the Allied 1945 offensive, as well as the Campaign Game. Tough decisions will have to be made by both sides as they allocate precious resources among their formations, determine their enemy's intentions and balance their plans, as well as attack and defend. 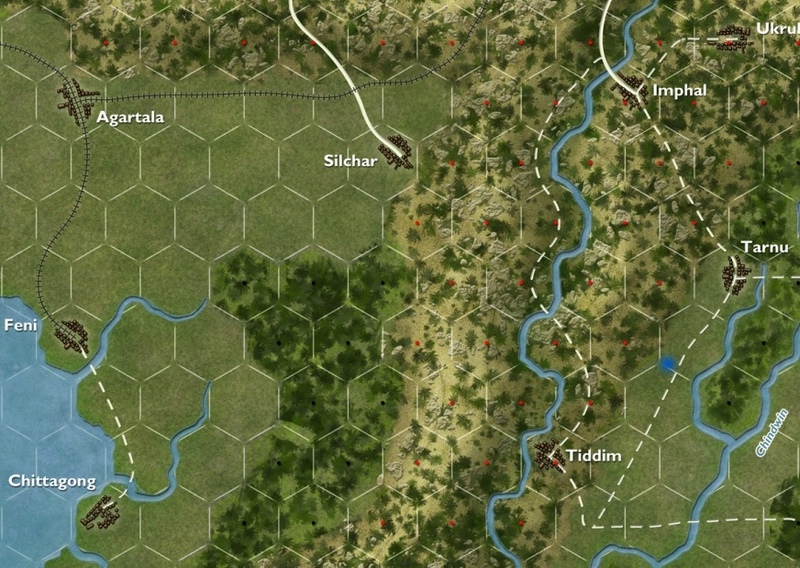 Players can get a feel for this game by playing a free minigame, also done by the designer, that covers the climatic battle of the 1945 Allied offensive, A Master Stroke: the Battle of Meiktila, which can be obtained here at the Line of Departure website. See the map to this game. Download the rules for Defeat into Victory (in PDF format).